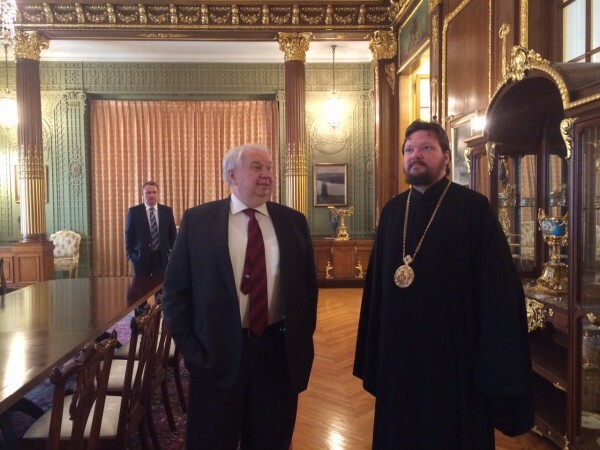 On March 12, 2015, the administrator of the Moscow Patriarchal Parishes in the USA, Bishop Ioann of Naro-Fominsk, met with Russia’s ambassador to the USA, Mr. S. Kislyak, at his residence in Washington. Bishop Ioann told Ambassador Kislyak about today’s life of the faithful who come to America from Russia and her neighbouring countries. They discussed a plan for joint events to mark the 70th anniversary of the Victory in the Great Patriotic War, the 1000th anniversary of the demise of Prince Vladimir Equal-to-the-Apostles and the Day of Love and Faithfulness. They also considered possibilities for extending the work with the youth. Bishop Ioann and Mr. Kislyak agreed to continue cooperating in areas of mutual concern for the embassy and the Patriarchal Parishes, the website of the Russian Orthodox Church in the USA reports.